The School of Journalism and Public Relations (SJPR) is founded in 2008 as a non-profit higher education institution, with a mission to enhance the quality of education in the field of communication, public relations, media and journalism in the Republic of Macedonia and promote regional cooperation among students and scholars. SJPR strives to provide students with comprehensive knowledge, abilities and skills to competently and creatively overcome challenges in the field of journalism, media, corporate communication and public relations. The School places primary focus on the student and applies the latest techniques to organize the teaching and studying processes. SJPR offers Undergraduate study programs in (1)Journalis and (2) Corporate Communications and Public Relations, and Professionally-oriented Graduate (Specialist) studies in (1) Media Management and Multimedia and (2) Management in Strategic Communications. The SJPR founded the Institute of Communication Studies (ICS) in 2012 in order to implement MA study programmes in (1) Management of Strategic Communications and (2) Media Management and Multimedia. MA study programmes has a twofold focus: First, to advance social sciences and to support communication and media professionals through its academic and applied research programs, and second; to develop a network of young researchers working on strengthening the pillars of these academic disciplines in the future. 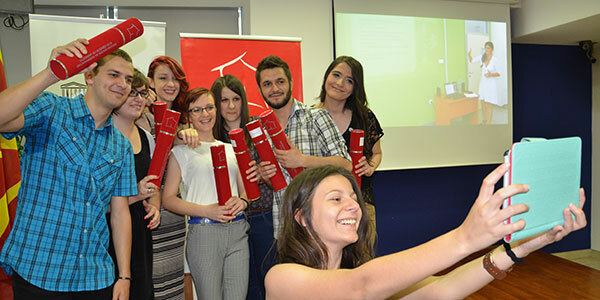 Both study programmes are implemented in Macedonia for the first time, incorporating international experiences and knowledge in the development of higher education, as well as the latest trends in both study fields. In addition, ICS develops academic and applied research to enhance knowledge in the sphere of communications, media and public relations and encourages young professionals and students to get involved research in the field. The Institute promotes innovative research ideas to respond to the needs of the industry and invests its resources in strengthening professional standards. By running its academic blog ResPublica, the Institute contributes to the debate in the online sphere about public interest topics. The Centre for Training and Professional Development "Career" operates as part of the SJPR, offering online courses for life-long learning and improvement of professional knowledge and skills in the areas of communications, public relations and new media. Additionally, the SJPR`s Career Center develops courses for managers and employees in companies and public institutions modified according to the client`s needs, directly contributing for enhancing their capacities and increasing their transparency and accountability. The trainers are prominent professionals for the country and abroad, including senior companies managers, PR experts, editors-in-chief and journalists who apply the latest market-trends in teaching. The SJPR develops partnerships and strong relations with the private sector, the media industry, public institutions and non-governmental organizations where internship is ensured for the all students. The best students are sent to partner universities in Europe through the student mobility programmes. So far, the School has established strategic partnerships with 25 higher education and research institutions from the country and all over the Europe. The studies are implemented within the UNESCO Chair of Media, Dialogue and Mutual Understanding, established at the School since 2011. The primary goal of the Chair is to raise the quality of higher education in communication and media, in accordance with the highest international and European standards in the field of higher education. The study programmes and other initiatives of the Chair are focused on the development of cultural diversity and promotion of intercultural communication and dialogue among various social and cultural groups in the Macedonian society. SJPR has conducted more local and international academic and applied research projects and has published books and other materials through its “Ex Libris” and "ResPublica" editions.